Among the many items on the this week’s City Plan Commission agenda are items 4, 5, 6, 7, & 8 all related to a proposed parking deck on Cedar Street on Federal Hill. This proposal is by the Omni Group, who also proposed, and were approved for a 6-story office building and parking structure at the corner of Cedar and Bradford Streets. As you’ll see here, the previous proposal is included in these plans. If you look at the CPC agenda, you’ll see that Omni Group is requesting some zoning revisions, which aren’t really an issue as far as I can see, bringing Downtown zoning over to Federal Hill is fine in my opinion. The highway is a false barrier between Federal Hill and Downtown. What they also seek however is the abandonment of a portion of Bond Street, and most of the remaining portions of Cedar Street. This, I’m not feeling. So first, one this we talked about when assessing the 50 Cedar Street proposal was the idea that a garage entrance on Cedar Street pretty much kills that street for the next 50-100 years. Certainly we have a major amount of development do to over the next several decades before streets like Cedar Street become “A” streets, but if we line streets with parking garages, they’ll never have a chance to support retail or other uses other than parking. This proposal makes all over Cedar Street a wall of parking garage, killing the streetwall for a generation (after demos resulting in surface lots have already killed the street for the current generation. But like I said, it may well be a generation before Providence is built out to the extent that Cedar Street becomes a viable “A” street, fine. The life of a parking deck such as the one proposed is probably also a generation. So just as Providence reaches the critical mass to support higher uses on Cedar Street, this parking deck will be at the point where it either needs a major rehab or needs to be torn down and replaced. The bigger issues is that the Omni Group is seeking to privatize Cedar Street for this period, and completely remove a portion of Bond Street, effectively forever (it is unlikely that in a generation when we re-assess this situation that Bond Street would come back). As you can see from the renderings above, Bond Street would be truncated at Jones Street to become an entrance from Atwells to the upper level of this parking deck. 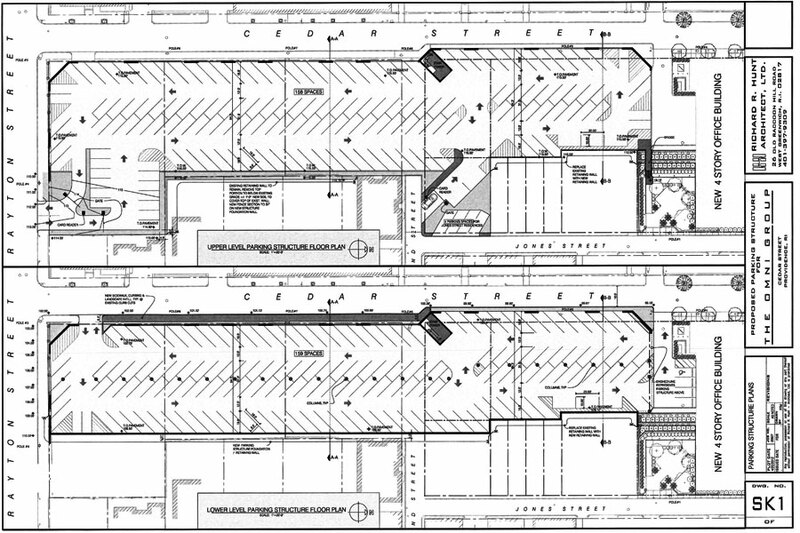 Another entrance to the upper level (as well as the exit) would exist at Brayton Street. If I’m interpreting these plans correctly, Cedar Street would become one way westbound and would be privatized at least from Bradford Street to Brayton Street. The renderings show a gate on Cedar Street at Brayton, indicating that Cedar would be used as the entrance and exit for the lower level of the garage (and presumably for the proposed garage at 50 Cedar Street. Now, maybe abandoning city streets to private interests to use for parking is a new thing that I’m not entirely hip to yet, after all, the Mayor seems to be all about it. I however am not, and neither should the Mayor be. For one, Cedar Street has parking meters on it. Is the City ready to give up this parking meter revenue? Is the City planning to charge Omni for the loss of revenue, how many years of lost revenue? And, the public uses these streets. We drive on them, walk on them, and park on them (well, Bond is only one lane wide so no one parks on it). Basically, this creates a massive super block on the back of Federal Hill controlled by Omni Group. And we haven’t even got into how doubling their parking capacity is going to impact the neighborhood as far as traffic and air quality (water run off shouldn’t be impacted as the site is already a paved surface lot). So, Greater City: Providence’s recommendation to the CPC? Just say “no.” Tell Omni to go away and come back with a proposal that uses only their property and does not seek to take streets and sidewalks owned by the City. Encourage Omni to consider a three level parking structure on a smaller portion of the land, allowing for future development of the remaining portion with a real building at a later date. Also, mandate environmental remediation to make up for the air quality and water run-off impact of this parking on the people who live in the neighborhood. Mandate bioswales, mature tree planting, alternate energy production for electricity used on site, etc. Also, there is nothing in the information I’ve received about this project, but Omni should be required to make the parking a neighborhood amenity by allowing it to be used at night for restaurants on Federal Hill. Having a large parking structure on the Hill will reduce our need for multiple small parking lots, allowing those lots to be put back into circulation for development. From now on when you do not see me weighing in on posts like this, just know it is because I agree with everything and have nothing substantial to add. Hah, I as well. Another balanced and thoughtful write up. In most of these situations, we should always ask for better. Why can’t Bond street also offer access to travel “through” the garage and out the other side, while also giving access to the garage itself? My main problem with it is its shear surface area. I understand the economy of scale, but they wouldn’t lose much to allow some driver/pedestrain permeability through the mass of the structure. I hate to be a nag (oh, who am I kidding?) but the City Plan Commission, while most of them probably read this blog (as they should) really needs to hear from people who have opinions about these major land development projects. Street “abandonments”, i.e., sales, are always a bad idea. And usually a very bad idea — the 38 Studios school of urban planning. This garage plan wants a street abandoned to make up for its poor design. If the city can get cash it seems not to care about the design. Ditto the streets Brown is buying from the city. Sell and close off Olive Street at Thayer, build the big Gilbane apartment building, and what a great traffic mess forever! Good luck to anyone ever needing an ambulance around there….everyone at the Thayer St. food court should consider themselves warned. These days, by the time major land development projects reach the planning department and planning commission, the decisions appear to have already been made. It is rare for any planning commissioner to go against what the city wants, regardless of how bad the city’s goals are. No transparency either, all seems shrouded in steel. No point in the public being there. Just pay your taxes, be quiet, and move along. The Coro Center privatized a portion of South St effectively damaging small business access in that corner of the Jewelry District. At the time it probably didn’t matter but as new businesses transitioned in (circa 2007-2008) and the I-Way Project took shape the city never addressed the issue with the west end of South St. … In fact they designed the traffic pattern around it and blocked it off completely. To my knowledge the street was declared abandoned in the late 60’s and Coro Center come how picked up the loose end and took advantage of the opportunity to accommodate their loading dock access. The City Council meets tonight with street abandonments and rezoning related to this project on the Agenda (.pdf). I understand that this proposal has been modified to create shared streets out of the partially abandoned streets. I have not seen specific plans however. I think the Council has called and canceled a meeting every night this week.